Getting there: From south MoPac, take the Loop 360 exit and head west. Turn left at the light at the intersection of 360 and Scottish Woods Trail. The road on the other side of 360 from Scottish Woods Trail is called Westlake High? Drive down Scottish Woods Trail until you get to a 'T' section in the road. Park along the road on Scottish Woods Trail because the other roads in the are much narrower. 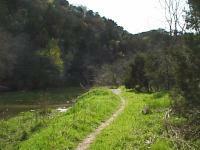 The entrance to the Barton Creek Greenbelt is just to the right of the 'T' intersection of Scottish Woods Trail and Camp Craft Road. Please be advised that this area is a residence with no marked parking. So please be on your best behavior here. Don't block the resident's driveways or mail boxes. If you're starting your hike early in the morning keep the noise down so as not to wake anyone. Be respectful of the folks who live here and get to the trail and back to your car quickly. 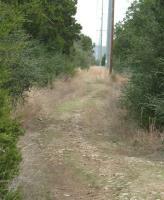 The Hike: The start of the hike, marked "Trailhead", is at the top of a hill over Barton Creek. 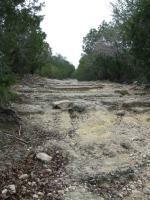 The first quarter mile is a steep drop of about 250 feet to the creek bed. This section of the hike will make your legs burn when you have to walk up it after 6+ miles of hiking. 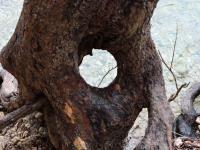 Right before you get down to creek level there is a restroom located near the waypoint marked, "Fork". Here you'll also see a fork in the trail with some options to go further upstream, which we'll explore later. 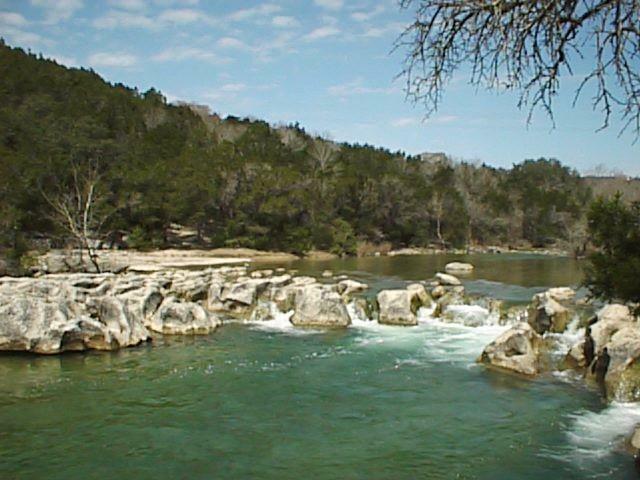 The first thing you'll encounter when getting to Barton Creek is a nice water fall with a picnic table perched on a large boulder, very close to the flowing water. This spot is marked with the waypoint "Falls". You'll see several falls along the trail, but this one is one of the nicer falls until you get to Sculpture Falls later on the trip. The trail near the waypoint marked "Rock Falls" passes near a large rock face to the left of the trail. This rock is relatively weak and prone to breakup. Don't worry, rock slides are not going to happen. But what has happened is that a large number of boulders have broken off of the rock face and come to rest at the trail level. Some of the boulders are huge. Some other areas are made up of large quantities of smaller rocks piled up along the slope. None of these rock falls obscures the path of the trail. 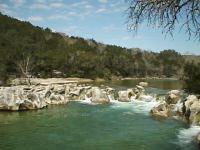 "Slanted Falls" is a small waterfall that is angled about 45 degrees off of the flow of Barton Creek. Several other falls dot the area, too many to bother marking on the map. The highlight of the trip is Sculpture Falls, marked by a waypoint of the same name. This is probably the loudest water fall on the Barton Creek Greenbelt. The water has carved very interesting patterns in the rock as you may be able to see in the photo. Better yet, see for yourself. A deeper spot on the downstream side of the falls makes for a good swimming spot. There are no springs readily apparent on this side of the creek, though when you get to the waypoint marked "Springs" you should be able to see the twin springs flowing from the rock on opposite bank. 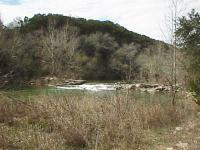 One of the more pleasant sections of all of Barton Creek can be found around the waypoint marked "Glade". At this point a rocky streambed crosses the trail, but on either side of the creek the terrain is relatively flat and completely covered in trees. 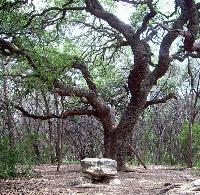 The trees make the area a little cooler and also help to filter out noise, adding to the tranquil setting. The waypoint marked "Twin Falls" is the location in which the established trail crosses Barton Creek and continues on the other shore. Twin Falls is a very popular resting place and can get crowded, particularly when the weather is good. If you prefer more solitude we recommend Sculpture Falls or Scottish Trail falls further upstream. The waypoint marked "Trail Access" is the official end of the supported trail. At this point the official trail heads up hill to the Cairnes access point. However, a well defined, but noticably smaller and less used trail continues downstream. Of course, we elected to take that route. The trail here is more challenging than the supported trail. 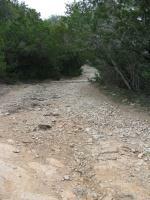 At one point, a rock fall completely covered the trail and partially obscured the trail continuation on the other side. Be careful crossing at the point marked "Rock Fall". Many of the rocks are loose. You won't run into many people along this portion of the trail. Mostly you may see and hear hikers and bikers on the other side of Barton Creek as they travel along the South Upper Barton Creek trail. 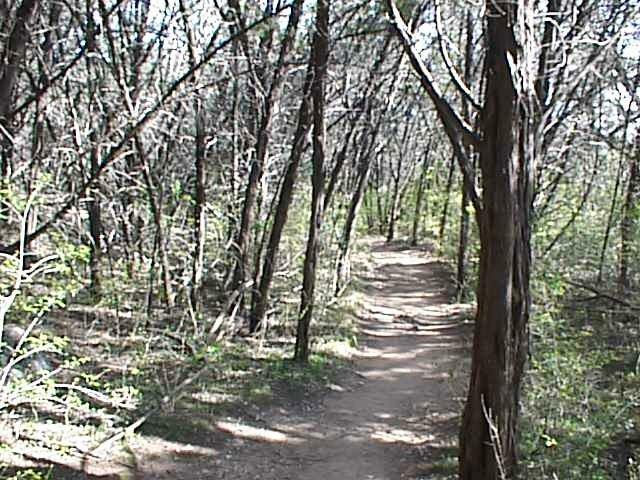 We turned around at the waypoint marked "Turn Around", though the trail continued onward and probably rejoins the established trail when it crosses Barton Creek at Gus Fruh Park. Very rocky terrain; very steep, lots of mountain bikes. You'll want walking sticks for this one. 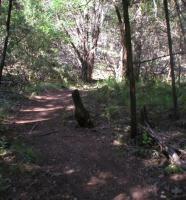 Side trails are nice & shady and offer more solitude than the main steep trail. Hill of Life packed on a sunny January Sat. No wonder solitude is rated 1 today, as the Hill of Life and the upper falls were packed with people and their dogs on this sunny Sat. after a very cold start of the new year. Introduced the hill to my 13 yrs old and she did the way back up with some minor complaints :-). On the way down we looked for a geocache off main trail which was fun. Try the trails that go off to the right. Great single trek for bikes! Hiked down "Hill of Life" and back up. lots of folks and dogs out enjoying the water today. also ran into a couple who were picking up litter along the trail. i need to get myself one o' them litter-grabbing thingies! my object today (in addition to a nice stroll) was to locate and view the old stone walls/fences (mentioned on page 152 of "60 hikes within 60 miles" 2nd edition). i found them easily enough (there are a few mtn bike trails that lead up to them), though mapping them will have to wait for another day. has anyone mapped them before? i can't find much info about them online. i figure they're from an old ranch/farm, though the hiking book says "Local legend has is [sic] that these rock formations were part of a failed Spanish mission from the early 1700s." to me they look like the sort of walls you build as you pull rocks out of the field so the plow doesn't bork on them, but they are in some interesting arrangements. added some pictures. coords are included in the descriptions. I registered just to comment on this place. This place is awesome. A word about the Scottish Woods/Camp Craft Rd entrance. Going down was cake for me. Going up...was a death march. Its my fault for not eating a morsel of food ALL day and for being stubborn and coming out here whilst still reeling from a week long cold. I actually finished the 100oz in my CamelBak. I stopped 3-4 times to rest. It was much more difficult then expected. 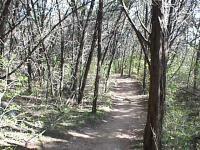 I'm no stranger to hikes, I love the trails in Austin. But this return hike upwards just passed me around the cell block. Will definitely visit again and be better prepared. Cool site!! I can see why this is a popular hike, once you scramble down the hill the walk is picturesque and easy. If I had more time, I would have kept on walking. 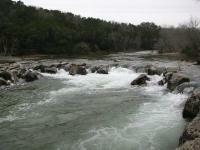 Since it has been raining in Austin, Barton Creek was running full and fast. For 45 minutes I had the walk to myself, and only saw two other couples the rest of the time. I'm glad I read this site before I headed back up to the top of the trail--it was more difficult than I expected! This walk will stay on my list of places to take people visiting Austin for the first time. 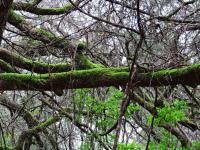 We parked on Mopac, didnt find the Scottish Woods trail but went to the end with a treehouse and ended at a bldg. Was a bit extreme near the end but that was the funnest part of all.